NFR Energy is acquiring $736 million in properties and plans to change its company name. The deal includes the acquisition of 66,300 net acres and 6,500 boe/d of production in the Anadarko Basin and Eagle Ford of South Texas. The company is spending $655 million for assets in the Anadarko Basin in North Texas and Oklahoma, along with $81 million for Eagle Ford assets. The Eagle Ford assets include 2,300 acres in what the company calls the "core of the core" in DeWitt County. The graphic to the right highlights the company's 2,300 acre Sugarkane Project in DeWitt County, but, as you can see in the graphic at the top of the page, most of the company's acreage is in Lavaca County near the Lavaca-Fayette county line. The company estimates proven reserves across its Eagle Ford assets is more than 20 million boe. Production in the area is approximately 55% oil and NGLs. The acquisition adds another core area of development for the company in the Eagle Ford. 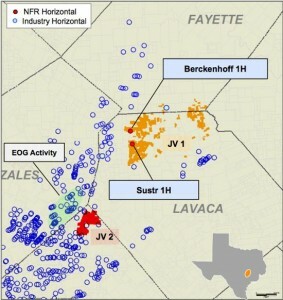 David Sambrooks, NFR's CEO, stated, "These acquisitions immediately result in a large, well balanced company with three major producing and development basins and exposure to oil, gas and NGLs...."
First Reserve, an energy private equity company, backed NFR as a start up in partnership with Nabors Industries. First Reserve is now acquiring Nabor's equity interest in the company. Once the acquisition is complete, NFR Energy will change its name to Sabine Oil & Gas, LLC.